Though Emperor Haile Selassie I was initially denied the emblematic statue of honor in the African Unity building due to the adamancy of the deceased prime minister of Ethiopia Meles Zenawi, it was however unveiled earlier on the premises of the African Union in Addis Ababa taking into account his mammoth contributions for the freedom and independence of the continent of Africa and its people. As facts go in the annals of history, Emperor Haile Selassie I, the revered “Father of Africa”, manifested his unfaltering commitment to the principles of collective security and the independence of Africa and Africans. He is also famed for providing homeland to the children of Africa scattered out of their country apart from providing scholarship to the sons and daughters of Africa in the then Haile Selassie I University targeted at making the dream of African Unity a reality. To dilate on the unveiling of the statue of Emperor Haile Selassie I on the premises of the African Union, this journalist had a short conversation with a range of scholars. 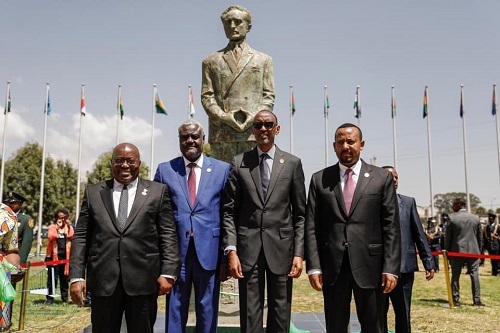 According to senior economist and a former student of Haile Selassie I University Teklebirhan Gebremichael, historical and factual evidence give validation to the appropriateness of honoring Emperor Haile Selassie I by erecting a monument on the premises of the AU Headquarters here in Addis Ababa. But the idea of doing so was curtly reflected by the former late Prime Minster of Ethiopia, Meles Zenawi on grounds which are still a source of speculation for many historians and analysts. He further stressed that all the possible arguments against honoring the Emperor hardly hold water. All are mere irrational sentiments that can easily crumble. The emperor was deservedly referred to as “the Father of African unity” by the Assembly of Heads of state sovereignty of the AU on his eightieth birthday anniversary. He ideologically and physically founded the AU by expediting the buildings of its headquarters in Addis Ababa and contributing to the Monorovia School of thought that advocated gradual and incremental integration for Africa as approved to the more radical Casablanca block. Journalist Kebede Anisa, who was editor in chief of the gazette Ethiopia Tikdem, knows the emperor in person. For his part Kebede said, “Africa had great personalities that contributed their share for the continent during trying times. Above and beyond, I would say, the contribution of Emperor Haile Selassie I surpasses all seeing that there was no stone he left unturned to unite Africa. He had conceived the idea of African Unity. To the surprise of everyone, he was the founder and believer in African Unity. Establishing the African Union was not a bed of roses. He went on to say, “The Emperor gave his all for the unity and liberation of Africa. The Emperor was a renowned person whose fame resonated across the globe. Once a meeting was held in the presence of thirty two African leaders here in Addis. While addressing the gathering the Emperor said, “Unless we ratify this charter we will not leave this hall. We will pass the night here.” At the end of the day, the leaders appended their signature on the charter. This shows his determination and influencing power. As his statue was not erected on the premises of the African Union, I was disappointed. Pessimistically, due to contrasting political interests within, the Emperor’s effort was denied recognition as his African contemporaries, who promoted the same ideals. Kwame Nkrumah from the west and Haile Selassie from the east were ardent proponents of the causes of Africa. But as to me Haile Selassie stands shoulder high. The statue of Kwame Nkrumah is erected. That is good. The unveiling of the Emperor’s statue, long overdue, on the premises of AU makes things full. When I heard the news I turned out to be infinitely happy. I feel like I am born again in this regard. He had worked for Ethiopia and Africa all his born days. He stressed that Emperor Haile Selassie was highly instrumental in liberating the Congolese from the yoke of the Belgians. In so doing he played a midwifery role in the birth of an integrated and free Congo. He dispatched three thousand Ethiopian troops that comprised one tenth of Ethiopia’s military resources at the time. Besides it is he who trained Mandela here. He went on to say, the Emperorhad played a major role in establishing the African Union in Ethiopia. All and sundry should know thishistoric fact. But when EPRDF came into power, it downplayed the contribution of the Emperor. I did not know the desired goal of throwing cold water on the contributions of the Emperor Haile Selassie I. “But the emperor’s statue should have been erected on the premises of the African Union first. He deserves praise, respect and appreciation for everything that he had done for Africa. To the best of my knowledge, the sole reason for the establishment of the African Union in the heart of Addis Ababa was due to the heroism of the patriots,” Lij Jermias added. As the Ethiopian Patriots are the reason behind the establishment of the African Union in Ethiopia, pertinent bodies should build patriots’ village so that tourists can drop in for a visit. As the Ethiopian patriots and the African Union are two sides of the same coin, talking about the latter turning a blind eye on the former does not help achieve the desired goal. 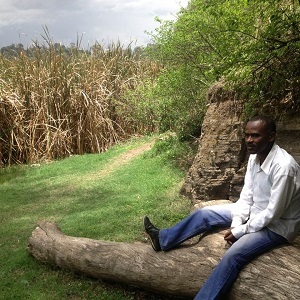 A published author, journalist, translator, host of a newspaper interview, contributor to magazines and teacher from Ethiopia. M.A holder in English from Addis Ababa University.